We aren’t normally the type of people to pat ourselves on the back, but we wanted to share in our excitement for being included in Trends & Tips Gift Basket Magazine! We know there’s a lot of tough competition out there, bringing beautiful, oh-so-giftable baskets every day, and we work hard to ensure we’re at the top of our game, with every one of the gift baskets we offer being something you can be pleased and proud to give. And that’s what makes us so happy that not one – but two! 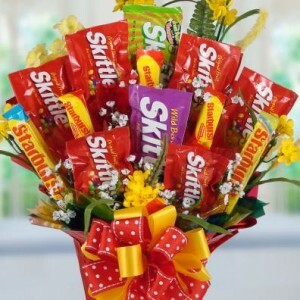 – of our gift baskets were recently featured in Trends & Tips. Everyone loves a little recognition for doing what they love well, and we’re certainly no exception! 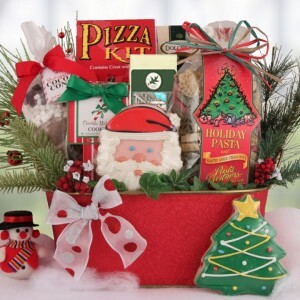 Christmas Party Gift Basket – Give someone you love a tasty dinner and cookie dessert with this unique gift basket! Packed with a pizza kit, mozzarella cheese, Christmas tree pasta, roasted garlic cream sauce, an amazing assortment of cookies and more, this gift is great for families, or anyone who loves Italian delights and sugary sweets. 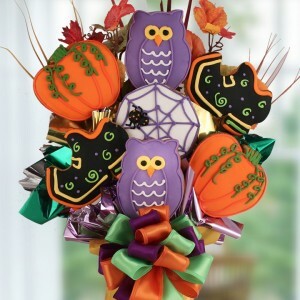 Happy Halloween Cookie Boo-quet – Cookie bouquets in general are one of my personal favorites, and this newer addition to our lineup is one of the coolest and cutest we offer. Available with 5, 7, 9 or 12 cookies, each cookie is carefully hand-decorated with bold, bright, eye-catching icing. These are as delicious as they are fun and festive, but be sure to take a picture before you dig in so you can remember them. Or, you can just look at their picture in Tips & Trends if you have a copy! Thanks to Trends & Tips for featuring us – it really is an honor, and just plain fun to see our gift baskets in print!